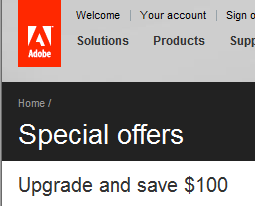 Were you aware there’s a place you can go anytime 24×7 that will always show you (most of) the latest and up-to-date specials running for Adobe products? There is. Here is the current special offers page for North America and here it is for the United Kingdom. There’s also pages for Germany and France. More may be coming in the future. Typical deals are like 10-20-30% off, or anywhere from a $25-$200 discount, or maybe a free book with purchase, depending on what’s running… In recent months there have been coupon savings on the different suite editions, Photoshop, Acrobat, Dreamweaver, Lightroom, Illustrator, InDesign, Flash Pro, and Elements. The promos are always changing, so feel free to check back for updates. 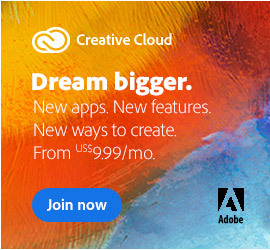 How much does Dreamweaver CS4 cost? 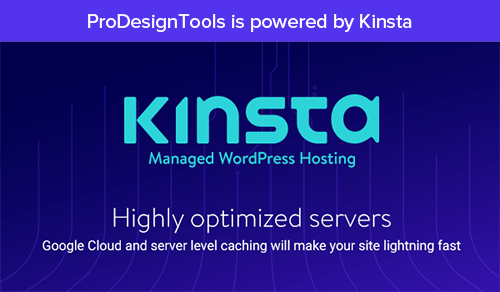 Hi Tim, looks like pricing starts at $199 but it depends on what product you have already, if any… You can find out the particulars here. Also if you want to test drive a full version first, you can download a free trial for 30 days. Is there anything that I can’t do with the 30 day free trial? I have a really really old version of Dreamweaver ( from 2000 ). Can I upgrade? Hi Chip, thanks for your comment. 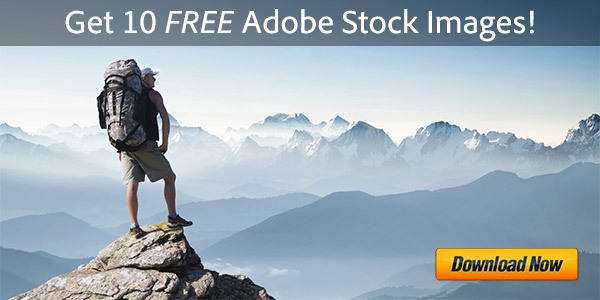 In fact there is nothing that you can’t do with Adobe’s free trials – they are fully-functional in every respect. As far as Dreamweaver upgrades go, you can check out your upgrade eligibility here. Hi Shepherd, if you are involved with schools you may qualify for Adobe’s Educational Store pricing, which offers very large discounts on most products, up to 80% which is remarkable. If not, but if you still have multiple computers to purchase for, then you can use their Volume Licensing Store to buy software that will run throughout your office with a single key, which helps reduce maintenance/administration while also offering pricing reductions. Most all products are available there too. Regarding your computers, if you want to see Adobe’s recommendations for running InDesign CS4, then you can simply scroll to the bottom of that page and check the System Requirements. 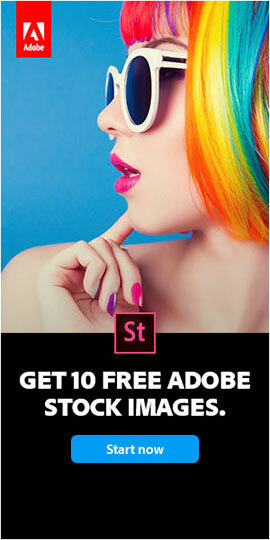 Lastly, if you’d like to receive occasional emails with new Adobe offers and exclusive subscriber discounts, you can subscribe to the free Specials Newsletter in the box to the upper right… Last time we sent around unique coupon codes that gave 20%-off savings on any Adobe purchase. Hope this helps! Hi Ted, I believe you could first install CS3 on your new computer, and then buy the upgrade (cheaper) version of CS4 and also install that there (from what I understand the two versions can coexist side-by-side and you can run both or either). If you want to now or later uninstall CS3, you can do so with its uninstaller, leaving CS4 in place. As for pricing, the upgrade cost for each tool or suite is given on its product page, and breakouts of the different suite configurations are given at CS6selector.com. Hi maybe someone knows why adobe offers cs4 master collection for $2,500 whereas some companies on the Internet offer it for far less. Is it just a scam, or what? If it’s true, what’s the difference? 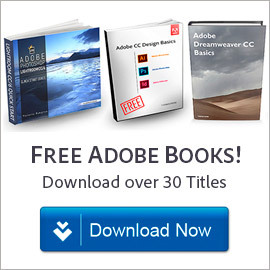 Note that the only place you can ever legally and safely download Adobe software (either trial or permanent versions) is directly from the Adobe website itself.